It's time for another Lil' Inker Designs Monthly Meet Up Challenge. It's an easy, low key, anything goes challenge using Lil' Inker products! 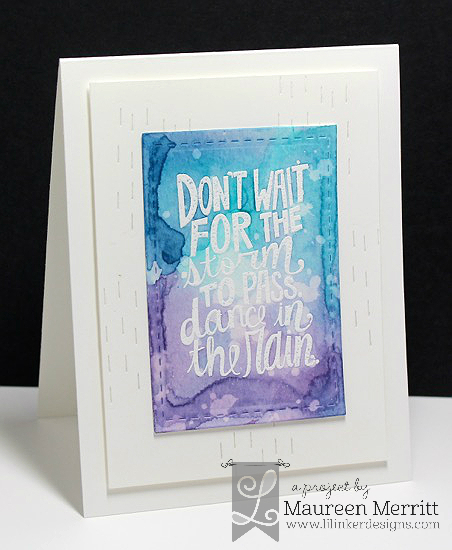 I thought it was more than appropriate to create a card using the Dance in the Rain stamp set this month. We've had rain for the past few days here. I sure hope it does bring beautiful May flowers. I'm having a blast with Distress Inks and watercolor paper lately. To make my card, I started by white heat embossing the sentiment on watercolor paper. Next, I took Dusty Concord, Peacock Feathers and Chipped Sapphire Distress inks and pressed them onto a large acrylic block. I spritzed the inks with water and laid the embossed layer right onto the ink. I kept pressing it into the ink until I was happy with the coverage, then I heat set it to dry. To add to the rain theme, I flicked some water onto the dried piece and lifted the water up with a paper towel to remove some of the ink and leave watermarks. Make a new project or share something you've been working on featuring LID goodies! Post this project to your blog or favorite gallery. Link your project to our challenge by using the InLinkz tool beneath my signature below. You have through April 18th at 11:30 PM EST to link your project to be eligible to win a prize. Projects should exclusively feature LID goodies to be eligible to win but do not need to exclusively feature LID goodies to join our Meetup. This month's prize is a $50 gift certificate to Lil' Inker Designs! Winners will be announced in a new blog post shortly after March 18th. Have fun and we can't wait to see what you're working on! I sure hope that you will play along! Head on over to Lil Inker Designs for all of the details! I really love the watercolor background you did with Distress Inks. So so so pretty! STUNNING Maureen!!! The watercolor is amazing, and SOOOO perfect with that sentiment! The die cutting in the background is the perfect finishing touch! Gorgeous card, Maureen! Gotta love Distress Inks when you watercolor. This is perfect! Maureen, I love your card! Its so pretty! You did a fantastic job on it and the verse IS appropriate for this time of year. I have, (believe it or not! ), only recently got into Distress inks and I am so hooked on them! I already have 24 colours and use them all the time. They are so versatile! Who knew??? LOL (Apparently EVERYONE but ME!) TFS! Gorgeous card!! The colors are so vibrant. Love it! StampNation Virtual Retreat is LIVE!